When my friend Sanjay Tiwari, who has been into health food business for quite some time told me that he is opening a restaurant in Delhi with a Gluten Free menu, I was delighted. Turns out this is the first of its kind in India. Initially, you could get a few friends and acquaintances to come try out the food, but that is no way to keep a restaurant going on a regular basis. Sanjay is smart. He does not keep it open 7 days a week. It opens only one day a weekend, and has a different theme every weekend. So I asked him to open a page on Facebook to reach out to a wider audience. The Cafe Amaltas Facebook page advertises the menu and he gets a headcount in advance, which helps him prepare adequate quantities of dishes. 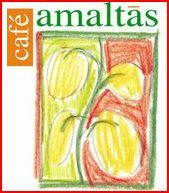 “This promoting Cafe Amaltas on FB was completely your idea, and it worked …. Now we have 1000 + people who like this page. We are yet to put signages outside our cafe … and yet people know about us. I think social medias are great marketing tools for ideas/ communities / products which are percieved to be be community benefiting or fun activities.” Sanjay says. 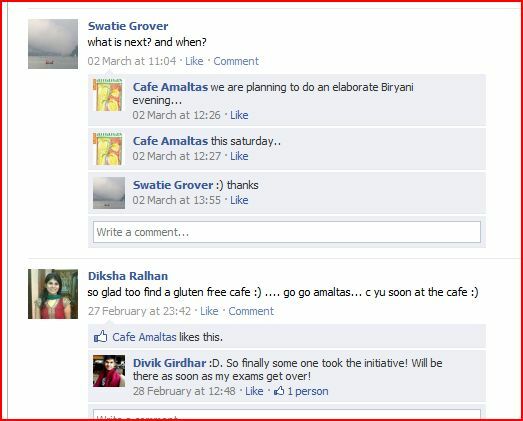 If you like to experiment with Gluten free food, or know more about it, visit Cafe Amaltas and talk to Sanjay. You can get to know their programs by liking the Facebook page . While one hears tremendous stories about how big brands are leveraging the power of social media, it is equally powerful in promoting off beat ideas – be it business or otherwise. Another story of a non business enterprise is coming up next.